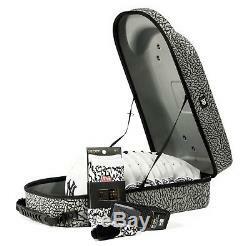 New Era & Homie Gear 3 Pack- HG Elephant Print Cap Carrier 12 Hats & New era.. There is no other case in the market that will protect 12 caps this is a perfect case for hat collectors Do not travel without protecting your hats! Homie Gear cap carriers are designed to give headwear collectors a sleek and stylish way to store and transport thier caps. These carriers are made of lightweight, crushproof neoprene. Eyelets allow ventilation with an included shoulder strap for carrying ease. Hard Protective Shell and New era Soxs and Belt Pack. New era & Homie Gear. Fresh Air Ventilation Fits 12 Snapback or Fitted Caps Hats. Have peace of mind knowing that your order will arrive original factory sealed packaging. You're already purchasing the item. That means having access to real people that get your questions and concerns answered quickly. Give us a shot and we will make sure that you will look to us again! The item "New Era & Homie Gear 3 Pack- HG Elephant Print Cap Carrier 12 Hats & New era" is in sale since Wednesday, January 24, 2018. This item is in the category "Clothing, Shoes & Accessories\Men's Accessories\Hats". The seller is "homiegear" and is located in US. This item can be shipped to United States, Canada, United Kingdom, Denmark, Romania, Slovakia, Bulgaria, Czech republic, Finland, Hungary, Latvia, Lithuania, Malta, Estonia, Australia, Greece, Portugal, Cyprus, Slovenia, Japan, Sweden, South Korea, Indonesia, Taiwan, South africa, Thailand, Belgium, France, Hong Kong, Ireland, Netherlands, Poland, Spain, Italy, Germany, Austria, Russian federation, Israel, Mexico, New Zealand, Philippines, Singapore, Switzerland, Norway, Saudi arabia, Ukraine, United arab emirates, Qatar, Kuwait, Bahrain, Croatia, Malaysia, Brazil, Chile, Colombia, Costa rica, Dominican republic, Panama, Trinidad and tobago, Guatemala, El salvador, Honduras, Jamaica, Antigua and barbuda, Aruba, Belize, Dominica, Grenada, Saint kitts and nevis, Saint lucia, Montserrat, Turks and caicos islands, Barbados, Bangladesh, Bermuda, Brunei darussalam, Bolivia, Ecuador, Egypt, French guiana, Guernsey, Gibraltar, Guadeloupe, Iceland, Jersey, Jordan, Cambodia, Cayman islands, Liechtenstein, Sri lanka, Luxembourg, Monaco, Macao, Martinique, Maldives, Nicaragua, Oman, Peru, Pakistan, Paraguay, Reunion.